It was written that the outbreak of the War in South Africa had a profound impression on the school. Some 110 OBs took part which in proportion to her numbers, approximately 1 in 6, was more than any other school in the Country. Of those that went 7 earned DSOs and 43 were Mentioned in Dispatches. There were 5 War Dead. Speech Day of 1905 was a memorable one, as it was made the occasion of the unveiling of the War Memorial. It was the work of the future Sir Giles Gilbert Scott (OB 98). A large and distinguished gathering were present. The Hon Charles Russell (OB 81), the Secretary of The war memorial Committee, after explaining how the scheme had originated through a chance meeting of four OBs upon the high veldt of South Africa, and had been enthusiastically taken up by those at home, invited Sir Evelyn wood to perform the ceremony. The Field marshal, himself the father and grandfather of Beaumont Boys ( his three sons all served in the War), spoke in reply, dwelling on the lessons of devotion and nobility to be learnt from the gallant dead. Frederick Stapleton-Bretherton Esq, whose son Robert was one of those killed proposed the vote of thanks, which was seconded by Sir Cornelius Moloney KCMG Colonial Governor, whose brother in law Captain Owen- Lewis was also slain. Sir Evelyn Wood in his reply, spoke of the remarkable position which Beaumont occupied during the war, and alluded to three of her sons Edmund Costello VC, General Joseph Gordon commanding the Australian forces and Sir William Codrington Bart whose conduct at the siege of Ladysmith was so conspicuously gallant. The Stations of The Cross in the School Chapel and copied from those in Antwerp Cathedral, together with two memorial tablets containing the names of the fallen, also form part of the War Memorial. The discovery of gold on the Witwatersrand in 1886 made the Transvaal, until then a struggling Boer Republic, potentially a political and economic threat to British supremacy in South Africa at a time when Britain was engaged in the scramble for African colonies with France and Germany. When the scheme of Cecil Rhodes, Prime Minister of the Cape Colony, to overthrow the Transvaal government of President Kruger by means of the so-called Jameson Raid, failed in 1896, Afrikaner nationalism again, like in 1877, flared up all over South Africa. The Orange Free State concluded an alliance with the Transvaal. Although Kruger was only interested in preserving its independence but the British believed that the Transvaal was pressing for a united South Africa under the Afrikaners. If the Transvaal would not reform, war would be the only way to eliminate a Boer oligarchy threatening British supremacy and to facilitate the development of the gold mining industry. In order to become involved in the domestic issues of the Transvaal, they agitated that the foreign mineworkers (Uitlanders) should get the vote and in 1896 the Jameson raid took place to trigger an uprising. It failed and in the diplomatic tussle that followed, Kruger refused to budge. A complete political deadlock was reached. On 11 October 1899, the second Boer War broke out after Britain rejected the Transvaal ultimatum. The ultimatum had demanded that all disputes between the two states be settled by arbitration; that British troops on the borders be withdrawn; and that troops bound for South Africa by ship should not disembark. The Orange Free State joined the Transvaal in accordance with the alliance of 1897. In the course of the war, the British Army was reinforced by volunteer contingents from Canada, Australia, New Zealand, the Cape Colony and Natal. The first five months of the war consisted mainly of set-piece battles. The Boers besieged Ladysmith in Natal and Kimberley and Mafeking in the Cape Colony, while the British forces strove to relieve their beleaguered garrisons in these towns – Lord Methuen in the west and General Redvers Buller in Natal. From their camouflaged positions, the Boers scored impressive victories at Stormberg, Magersfontein and Colenso in mid-December 1899 (called 'Black Week' in Britain), and Spioenkop in January 1900.But by late February 1900 there was a definite change in their fortunes. Kimberley and Ladysmith were relieved and the Boers surrendered at Paardeberg with 4,000 burghers. All Boer fronts collapsed. The next six months was a period of great confusion for the Boers. Everywhere they were compelled to retreat. On 13 March 1900, Lord Roberts, the British commander in chief, occupied Bloemfontein and on 5 June 1900 he took Pretoria. With both republican capitals in British hands, he annexed the Free State as the Orange River Colony on 24 May 1900 and the Transvaal on 1 September 1900. The relief of Mafeking on 17 May 1900 caused tumultuous joy in Britain. After Roberts dispersed the Transvaal forces in the last pitched battle of the war at Bergendal (Dalmanutha), in August 1900, the Boers applied the tactic of swiftly gathering their scattered commandos whenever the occasion arose, attacking isolated British columns and then disappearing into thin air. In this way the resistance of about 20,000 Boer bitter-enders was to continue for almost two more years, in what is known as the guerrilla phase of the war. The conflict finally ended in May 1902 with generous terms by the British to regain the support of the Boers. Lt Alfonso Byrne Bedfordshire Regiment (OB 90). The son of General Thomas Byrne of Tekels Castle, Camberley (now demolished). His mother was a daughter of Don Pablo Larios of Malaga (her five brothers were at Beaumont). Alfonso followed his two elder brothers to the school, the elder Gerald was a Captain in the Rifle Brigade during the Boer War later rising to Lt Colonel in WW1 and awarded an OBE. Alfonso gained a commission in the 3rd or Light Infantry Militia Battalion but went to South Africa to assist with the remount service. “In terms of horseflesh, on the eve of war in October 1899, the British were utterly unprepared. While the Boers simply had to provide their own horses on commando, the British army had to muster a mounted force, larger than any it had ever mobilized before, and then transport it 10,000 kilometres to South Africa—farther than it had ever previously had to. It soon became clear that pre-war remount estimations had been dangerously optimistic. (“Remounts” are supplies of fresh horses for those worn out or killed.) Predicting a speedy victory in a “teatime war,” the Imperial army entered the conflict with the idea that a mere 125 cavalry horses and 250 mules per month were enough and that the troops and their steeds would be home by Christmas. This prediction was to be wrong by a factor of ten. As one colonial combatant observed: “I never knew there was a remount service before this war. It has its hands full now”. The Remount Department had been established over a decade earlier, in1887, to set up a register of horses that could be deployed in times of crisis. This floating pool of owners enjoyed a small but steady financial supplement by gambling against the outbreak of such a crisis. With war imminent, 6,000 horses were immediately enlisted in this way. On board ship, horses were compelled to stand in stalls during their weeks at sea, unable to roll or lie down. Occasionally insufficient fodder was packed, and horses simply starved to death. Aeration was inadequate, and the stalls were poorly designed, which made it difficult to muck out the decaying dung and excoriating urine. As a contemporary noted with dry understatement, “Horses and mules do not make good sailors.” Yet, of the 352,353 horses who embarked for South Africa from all ports, only 13,144 failed to survive the voyage—a loss rate of only 3.73%. It was not so much the voyage that killed them but its aftermath: its debilitating effects coupled with the absence of an acclimatization period. In the absence of acclimatization depots, horses would arrive incapacitated—dehydrated, malnourished, and their immune systems severely compromised—and instead of having the weeks or months needed to revive, they would be transported to the front almost at once. There were insufficient supplies, which entrenched constant low-level malnutrition. The Remount Commission was increasingly condemned, but its remit was extremely difficult from the very outset”. Alfonso was posted to No1 Remount Depot at Bloemfontein where enteric fever (typhoid) had broken out in February 1900: it was due to polluted water. The Boers had seized the water works supplying the town so the troops used wayside pools and other sources that were contaminated and the precaution of boiling the water was omitted. The enteric outbreak was to cost the lives of more men than the two largest battles of the war. Some 6000 men came down with the severe and protracted fever, over 1000 died including Alfonso who had only arrived a few weeks before his death on 10 June 1900. Buried at Bloemfontein. Lt John Lawrence Lawlor 6th Inniskilling Dragoons (OB 84). From the Toronto Press: “Lieut Jack Lawlor, owner of the big Lawlor Building at the northwest corner of King and Yonge streets, has been killed in South Africa. He was an officer of the 6th Inniskilling Dragoons, which belongs to General French's division. Avenue, died when "Jack" was a few months old. The property at King and Yonge streets was inherited by young Mr. Lawlor from his father who in turn had inherited it from his father. It is now one of the most valuable locations in the city. Young Mr.Lawlor was educated in Europe, and took to the army as a profession. On Leaving Beaumont Jack initially gained a commission in the Militia Princess Victoria’s Royal Irish Fusiliers but in Dec 1896 was offered a place in the 6th Dragoons. He was promoted Lieutenant March 1898 and was adjutant of his regiment from February 1900, and accompanied it to South Africa in November 1899, where he saw much service in the north of Cape Colony, at the relief of Kimberley, and the advance on Bloemfontein. On 30 August: "President Kruger was reported to have been at Waterval Onder the previous day, and General French was anxious to obtain news. So B Squadron of the Inniskillings, under Major Dauncey, was ordered to descend to the town and bring away the prisoners we had taken, among whom was a wounded soldier of our own. The enemy, hidden in the rocky kloofs and bush beyond the town, completely commanded the drift and approaches, and also the town itself. The squadron gained the town, galloping over the exposed ground through a hail of bullets. Lieutenant Lawlor, at the head of his troop, was mortally wounded, shot through the body. He was a fine officer and a great loss to the regiment, and died cheery and brave to the last. Major Dauncey himself, charging in advance of his squadron, with Lieutenants Lawlor and Johnson, was grazed by two bullets, but the town was reached. In it none could show without being shot, so cover was taken in the buildings and the prisoners were not brought away till darkness ensured a safe return". There is a story of their wounded soldier that he had fallen in love with an Afrikaans nurse in Waterval Onder. The couple both perished on 30 August 1900 when the British forces took over the town. Their ghostly apparitions have since been meeting at a peppercorn tree (ghost tree) in Waterval Onder. However, in the 1960's the tree was blown over in a severe storm and since then no sightings have been reported. Lt John Lawlor is buried at Waterval Onder where his grave can still be seen. Lt Arthur Edward Murphy Victoria Mounted Infantry (OB 74). Arthur came to Beaumont from Melbourne, Australia and returned there to become a dairy farmer. Following the Federation of Australia and the formation of the Australian Army, Arthur, as a member of the Militia, mobilised with the 5th VMI. This large Contingent required three transports to convey it to the war, namely, the Orient, the Argus, and the City of Lincoln, leaving 15th February, 1901. The bulk of the Regiment went in the former ship, the horses and a horse-deck guard of about 100 in the two latter. They also went different routes on arriving at Cape Town; for the horses (one shipment having rested at Maitland Camp) were sent along the coast to Durban, and there landed and entrained for Pretoria; whilst the men finally disembarked at Port Elizabeth and entrained there, proceeding through Cape Colony and Orange River Colony to Pretoria, where the Regiment was mobilized between 24th March and 4th April, 1901. On the 10th, they went to Middelburg, East Transvaal, to join General Beatson's column, and started on the first trek, moving north from the Delagoa Bay line on the 13th. Between that date and 23rd, they were constantly in touch with the enemy, and captured a convoy of 21 wagons, 16 prisoners, at Leeuwfontein. The horses were greatly knocked up and many died from wounds received in action. Four companies returned to Middelburg for remounts, the other four remaining with the column. On the 11th, the Regiment was divided into two wings which were re- united at Bronkhorst Spruit; and the total results of the trek were - 6 Boers killed, 124 prisoners, 17 surrenders, 183 rifles, 31,450 rounds small arms ammunition, 212 wagons, 58 Cape carts, 100 horses, 65 mules and donkeys, 2,460 cattle, 5,600 sheep, 800 trek oxen, 4,700 bags mealies, &c. - all the work of the Fifth. This return is presented as an example of what was usually accomplished in these treks. Between the 18th May and 10th June, there were constant engagements at Rhenoster Kop, Klippan, Kornfontein, and Drivelfontein, where Lieutenant Murphy was killed (29th May), besides one N.C.O. and two men. Captain Francis Owen-Lewis Durham Light Infantry (OB 85). Francis was the second of four brothers at Beaumont, the sons of Henry Owen- Lewis a DL for Co Monaghan and MP for Carlow. After Beaumont, Frank entered the Durham Light Infantry through the Militia in 1891 and was posted the Indian Staff Corps, the 14th Bombay Infantry in 1894. He was stationed in Poona and was given the task of stamping out plague that had originally broken out in 1887. The efforts to suppress the disease drew down upon Captain Owen-Lewis, the hatred of the natives where “their habits were interfered with”. Frank had a remarkable escape from the assassin’s hand at this time. Together with the Commissioner and another officer and his wife, they attended a reception at Government House. On leaving, the other officer took Frank’s carriage by mistake. In the course of the return journey, the Commissioner was shot and mortally wounded and the officer had his brains blown out by a fanatic believing his victim to be Frank: the change in carriage had saved his life. Having dealt with the plague to the satisfaction of the authorities, Frank went to the more peaceable Windward Islands as ADC to the Governor and acting correspondent for “The Times”. He also found the opportunity to marry the daughter of Sir Charles Shand, Chief Justice of Mauritius; a seemingly improbable union being oceans apart. In 1899 he was posted to South Africa with Lord Metuen’s HQ. The two Boer Republics, the Transvaal and the Orange Free State, began the war against Great Britain on 14th October 1899. Their principal operation was to invade Natal. They also began sieges of Mafeking and Kimberley, both important towns along the western borders of the two Boer republics. The authorities in Great Britain prepared to send an Army Corps to South Africa under the command of Lieutenant General Sir Redvers Buller. The three battles in Natal, Talana Hill on 20th October, Elandslaagte on 21st October and Ladysmith on 30th October 1899 saw the British force in Northern Natal under Lieutenant General Sir George White penned up in Ladysmith and put under siege by the Boers. Buller arrived in Cape Town and prepared his strategy for the war. Lord Methuen would command the force with the task of marching up the railway running north along the western border of the Boer Republics to relieve Kimberley and eventually Mafeking. Lieutenant General Lord Methuen landed at Cape Town on 10th November 1899. His task with his division was to force his way north up the route of the Cape Town to Bulawayo Railway and raise the Boer siege of Cecil Rhodes’s diamond town, Kimberley. The British authorities feared that a Boer capture of the town would considerably increase the financial resources available to the Boer republics through access to Kimberley’s diamond mines. Working their way up the railway line, Methuen fought an inconclusive battle at Belmont 23Nov storming the hilly positions only to find that the Boers had slipped away. In the afternoon of 24th November 1899 Methuen’s force continued its march north, parallel to the railway line. Methuen stopped at Swinks Pan, a station further north on the railway line, and camped. Scouts Including Frank Owen-Lewis were sent out on a reconnaissance and confirmed the presence of a Boer force at Graspan. It was on this mission that Frank was killed. A memorial was erected to his memory by his brother officers. Two of Frank’s brothers Arthur (Capt. Yorkshire Regiment) and Cyril (Member of The Cape Legislative Council) were awarded DSOs during the War. Lt Robert Charles Lucius Stapleton- Bretherton Royal Fusiliers (93). The second of four sons at Beaumont. Their father was Frederick and their mother the Hon Isabella a daughter of the 12th Baron Petre. Robert was commissioned into the Hants Militia and later served in Africa as an Assistant Inspector of The Gold Coast Constabulary. Born in August 1875 he was a keen sportsman and a good horseman, Serving in the Gold Coast Constabulary until April 1900, he was commissioned into the Royal Fusiliers as a 2/Lt. (He held the rank of Captain whilst in the Hants 3rd Battalion.) Serving with the 1st Battalion from June 1900 in Bombay, then in South Africa from December 1901, with the 20th Mounted Infantry under Colonel Dawkins. Operating in the Frankfort District, he was in operations against De Wet. Some fighting took place on Jan 28th, on the following evening the whole column began an attack on a large force of Boers, 25 miles away. The Boers were suprised, but made a determined stand. With about ten men, Lt Stapleton-Bretherton rushed forward to attack and , if possible capture some of the enemy, and was shot through the heart. He is buried on a hillside at Kaffirstad, on the Harrismith-Frankfort road, about 25 miles from the former place. A marble cross and fence mark his grave. Age 26. Robert’s elder brother Frederick served as a Captain in the Imperial Yeomanry. The experiences of some other OBs of interest who served in the War. Major General Joseph Maria Gordon (OB 73). He was born on 18 March 1856 at Jeréz de la Frontera, Andalusia, Spain, son of Carlos Pedro Gordon and his wife Elena, née Prendergast. He was baptized José Maria Jacobo Rafael Ramon Francisco Gabriel del Corazon de Jesus Gordon y Prendergast. He left Spain with his parents, in 1867, for Scotland where the family settled on an inherited Wardhouse in Aberdeenshire. From Beaumont, Gordon entered the Royal Military Academy, Woolwich, in March 1874. At that time, while still a cadet, he dined with the future King of Spain, Prince Alfonso, who was in exile, attending Sandhurst. Prince Alfonso was proclaimed King of Spain in December 1874 and received the news while with Gordon in London. During that time Spain was engaged in a civil war, the Third Carlist War, and Gordon told Prince Alfonso that he had made plans to travel to northern Spain and join his enemy The Duke of Madrid (son at Beaumont) with the object of gaining military experience. Prince Alfonso told Gordon that he could give him a letter of recommendation so he could join the royalist army, but Gordon declined. In February 1876 Gordon became a lieutenant in the Royal Artillery. He was stationed in Ireland in 1877-78, then contracted rheumatic fever and resigned his commission on 16 August 1879. For health reasons he sailed to New Zealand where he became a drill instructor in the armed constabulary. Gordon then went to Melbourne, and while trying to obtain military employment entered two unsuccessful business ventures and for a few months went on the stage. His expectations of a commission in Victoria's permanent artillery were not realized, but through the influence of the governor of South Australia, Sir William Jervois, he was employed as a mounted constable in Adelaide in June 1881, then in December was offered an artillery appointment. He began duty in January 1882 as a subaltern on the permanent staff. He had come to South Australia just when a permanent artillery unit was first being raised; his promotion was rapid and by May 1892 he was a lieutenant-colonel. 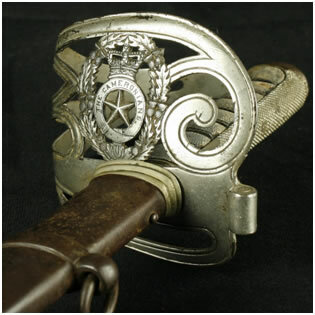 In 1885, as a major he had commanded Fort Glanville and produced a trophy to symbolise defence consisting of a rising sun of swords and bayonets around a crown: this was later adopted as the general service badge for those forces going to the war in South Africa. On 29 February 1892, he married Eleanor Fitzgerald (d.1910) at St James Catholic Church, Elsternwick, Melbourne. In July 1893 he was appointed commandant of the military forces of South Australia and held the rank of colonel. When the South African War began in October 1899 Gordon had been serving temporarily in London. After returning to Adelaide he sailed for Cape Town in January 1900 as chief staff officer for Overseas Colonial Forces. Gordon took part in military operations in Cape Colony, the Orange Free State and the Transvaal. For his work in South Africa he was appointed C.B. and mentioned in dispatches. In December 1900 Gordon was granted the 'local and temporary' rank of brigadier general. Federation brought no immediate change in his career, except that after 1 March 1901 he became responsible to the Federal minister for defence, and in the long run it brought him no promotion. In 1902 he was transferred to Victoria where, from July 1902 to January 1905, he commanded the Commonwealth Military Forces in that State; he held the same post in New South Wales in 1905-12. In May 1912 Gordon became Chief of The General Staff till 31 July 1914. He was at sea on his way to England for a holiday when World War I broke out. He offered his services to the Australian government but the offer was refused. In the United Kingdom he commanded the 92nd Brigade and the 10th Reserve Division, British Army, in 1914-15, was an inspector in the Ministry of Munitions in 1916-17, and in 1919 was with the army of occupation in Cologne, Germany. On 1 November 1921 he was placed on the retired list of the Australian Military Forces with the honorary rank of major general. After the war Gordon lived in England and in 1921 his autobiography, The Chronicles of a Gay Gordon, was published in London. Survived by his son and daughter, he died of cancer on 6 September 1929 at Egham, Surrey, and was buried in the Catholic section of Old Windsor cemetery, Berkshire. Gordon was a keen, energetic and tenacious officer who made the best of the scant means at his disposal to keep himself professionally informed and efficient. None of the governments he served in Australia sent him to courses of training in England. He was, moreover, an officer with ideas. He was an early exponent of universal training and was active in the early development of military aviation in Australia and in the creation of the Small Arms Factory at Lithgow, New South Wales. But officers with ideas gather enemies as well as friends in seats of power and Gordon's fate in this respect, especially after Federation, seems to have been no exception. Lt Colonel Sir William Codrington Bart. 11th Hussars (PAO) (OB 84). William was born on 18 April 1867, the eldest son of Sir William Codrington, 5th Baronet, and his wife Mary. He was commissioned Second Lieutenant in the 11th Hussars on 31 December 1900, having previously served in the Militia, and was promoted Lieutenant on 24 October 1892. He served with the 11th Hussars during the operations on the North West Frontier of India between 1897 and 1898, and with the Imperial Light Horse in South Africa during the Boer War. He was present at the Defence of Ladysmith, including the action at Wagon Hill on 6 January 1900, where he was dangerously wounded: ‘All the available members of the regiment, numbering some 200, were now in action. Sick men who had been excused duty voluntarily took part in the action, and even the cooks, greasy but determined fellows, had forsaken their pots and pans and had joined in. The Regiment occupied an irregular line, conforming to the cover offering, diagonally across the hill from the end of Cæsar’s Camp to the main sangar and on to Wagon Point. The enemy came ever nearer and nearer, firing thick and fast with explosive bullets. The Colonel was in the firing line of “E” Squadron, together with Captain Codrington, and the latter, in a gallant attempt to rush forward to adjust his line to a better position, in order to stop the enemy’s deadly short-range fire, was put out of action by a gun shot through the liver. He was dragged back under cover, at terrible risk and with the greatest difficulty by Corporal W. Weir, who for his plucky action was afterwards awarded the D.C.M. Captain Codrington lay some time between life and death, but eventually lived to do many a good day’s work with the Imperial Light Horse throughout the Boer War.’ (The Story of the Imperial Light Horse, by G. F. Gibson refers). Promoted Captain on 21 January 1901, for his services in the Boer War he was Mentioned in Despatches (London Gazette 9 July 1901) and granted the Brevet of Major, 22 August 1902. He served during the Great War with the 11th Hussars in France from 1914, was promoted Lieutenant-Colonel, and commanded the 1st Motor Machine Gun Brigade, Machine Gun Corps. Sir William Codrington married Miss Joan Rogers, daughter of Harry Rogers Esq., on 25 April 1903, with whom he had two sons. He succeeded to the Baronetcy upon the death of his father on 1 March 1904. Sir William died on 7 November 1932, and was succeeded to the Baronetcy by his eldest son William (OB 16). Captain Monthermer Hume Montague Namaqualand Border Scouts (OB 82). He was born in 1868 the son of the Rt Hon Lord Robert Montagu and GS of the Duke of Manchester. He left England to seek his fortune and initially went to South Africa. The town of Montagu in the Western Cape was named for his Uncle John Montague. When the War broke out Monthermer held a commission in the NBS.This corps, about 360 strong, was almost wholly recruited from half-castes that worked in the mines. "They were an excellent force, which did a great deal of hard patrol work, and had several stiff brushes with the enemy. They were conspicuous for consistently refusing to surrender when surrounded, as patrols were at times. They would keep up a fight till dark, and although half of them were killed the survivors of the party would escape. They made wonderful marches without water in their desert country". The work of the regiment was very similar to that of the Border Scouts. The corps was employed in their own district in 1901 and 1902, and had the good fortune to be part of the garrison of Ookiep when that town was besieged in April 1902. The force which held the town made a most excellent defence, and were complimented by Lord Kitchener. Their will to fight, if needs be to the death, came from the Boer attitude towards them as combatants. Blacks and coloureds were not scouts but spies and not recognised in their code of warfare. Harsh acts and executions were carried out on captured personnel and many were shot out of hand. General Kritzingen issued a proclamation in July 1901 that all coloureds caught in the service of the British will be summarily executed. Whether it was retribution or justice, the British reaction was to hang any Boer found guilty of murdering black or coloured people. When the war ended Montagu helped to found the Branch of The Legion of Frontiersmen in South Africa. This was a patriotic organisation formed in Britain in 1905 and designed to bolster the defensive capacity of the British Empire. Prompted by pre-war fears of a pending invasion of Britain, the organisation was founded on a romanticized conception of the "frontier" and imperial idealism. Headquartered in London, branches of the Legion of Frontiersmen were formed throughout the Empire to prepare patriots for war and to foster vigilance in peacetime. Despite persistent efforts, the Legion never achieved more than sporadic and tenuous official recognition, but it raised battalions and its members enlisted en masse at the onset of the First World War. Monthermer served during WW1 in the East African Campaign and was awarded an MC. After the War he settled in Kenya where he was a member of The Legislative Council. He died in 1954. Major Cyril Alexander Owen Lewis DSO (OB 85). The brother of Francis (above).Formerly a Captain 5th Bn Royal Irish Fusiliers, He left England for South Africa where he took up politics and became Secretary of The British South Africa League working with Cecil Rhodes. When the War broke out, he joined the Cape Colony Cyclists' Corps. He was created a Companion of the Distinguished Service Order [London Gazette, 31 October 1902]: "C A Owen-Lewis, Major, Cape Colonial Cyclists' Corps. In recognition of services during the operations in South Africa" One of the actions that earned him his decoration was in June 1900 when he rode alone to the village of Mooiplats in Bechuanaland and some 30 miles from Vryburg the British base. He was escorted to the Boer leader and informed him that Pretoria had been captured and that their cause was lost and concluded by inviting him to lay down his arms. There followed a meeting of the Burghers at which they decided to surrender their arms and ammunition. Cyril returned to Vryburg in triumph with 30 Mausers and 1500 rounds of ammunition together with a number of the residents who then took an oath of neutrality. When the War ended Cyril returned to politics and became Member for Beaufort West in the Cape Parliament. He died of pneumonia in London 1905. Brigadier General Carlos Joseph Hickie Gloucestershire Regiment (OB 88). He was born in 1873 the second son of Colonel Hickie of Sleyre. He was first commissioned into the Gloucesters and joined the 1st Bn. who had just been sent to South Africa. Fortunately, he was not with that part of the Bn that had a disastrous action at Nicholson’s Nek during which they were surrounded, ran out of ammunition, suffered heavy casualties and were forced to surrender 30 Oct 1899. The remainder including the newly arrived 2nd Lt Hickie were at Ladysmith which came under siege on the 2Nov 1899. Like many of the defenders, he had to survive with polluted water from the Klip River and chervil; this was a paste made from equine carcases and akin to Bovril. After 118 days, General Buller broke through the Boer positions and the Ladysmith force was saved the ignominy of surrender at the end of February. With His Regiment decimated and sent to Ceylon, Carlos transferred to the KOYLI. Within a fortnight of the siege being raised, he was at Driefontein with a battalion of his new regiment and this time the British not only fought well but won, putting the Boers to flight. At the end of the battle, Carlos was a casualty but lying in his tent rather than a hospital bed. A Mauser bullet had passed through his left boot grazing his foot and then ricocheted through a tin of cocoa in his haversack and then lodged inside another where he discovered it. Carlos “Cocoa” Hickie was wounded again before the conflict ended. In WW1, he commanded a Battalion of the Royal Fusiliers before being given command of a Brigade in 1916. Brigadier General Hickie CMG retired 1922 and died in 1959. His younger brother Manuel was in South Africa as a volunteer with the Imperial Yeomanry. He was only 18 and had left Beaumont in 1891. Major Walter Waltrude Meldon Royal Inniskilling Fusiliers (OB 97). Known as Budge and the third son of Sir Albert Meldon of Bray. He went to the Cape with the 1st Bn arriving at the end of November 1899. Brigaded with the Dublin Fusiliers, Budge was loaned to their 1st Bn and took part in the final battle during Black Week, when in 1899 the Boers inflicted three humiliating defeats on the British, and brought about the call for more troops from elsewhere. Colenso 15 Dec. was fought to try and make a breakthrough to relieve the besieged forces at Ladysmith. Budge was in command of the lead platoon of the Dublin Fusiliers that were at the head of the 5th Irish Brigade assaulting the Boer defensive position. The guides led them to the wrong river crossing where they came under intense enemy fire. Budge reached a point short of the Boer trenches and fell wounded three times by rifle fire. Behind him the remainder of the Battalion and the Brigade were trapped. Budge was hit again twice in the shoulder while in an exposed position and had to lie there for seven hours in the boiling sun until the firefight slackened and he was able to crawl to a place of safety. Over 500 men of the Brigade lay dead or wounded about him and of the twenty he had led on the assault only three remained alive. It had been just a few weeks before that Budge was playing cricket for The Cape against an MCC touring side. On his return to England Walter retired from the Army and spent much time with his brothers and cousins playing cricket: five of them played for Co Galway. Budge also played for Warwickshire as a right-handed batsman and medium fast bowler. He was selected three times for Ireland. In 1914 he returned to the Colours as a Major in the Ox & Bucks LI. Serving both on the western front and Mesopotamia. He was wounded again at Kut (5th time).He was awarded a Croix de Guerre and the Legion d’Honour. In peacetime, he played minor counties cricket and was resident magistrate at Killaloe. He died in 1957. Budge’s brothers were also in South Africa: Philip (OB 95) was commissioned in the RFA on 28 March 1900. From 1900 to 1902 he served with the 53rd Battery and took part in the operations in the Transvaal east of Pretoria including engagements at Belfast and Lydenburg. He was wounded and return to the United Kingdom on board the SS Simla in May 1902. In WW1, he served in France and the Dardanelles and awarded a DSO. He had the distinction of playing both cricket and football for Ireland. He died in 1942. James (OB 95) was in South Africa with the RAMC and later in Palestine during WW1. Major Vincent Joseph Kelly Royal Irish Rifles (OB 85). He was born in Dublin, 1868, the son of Joseph Christopher Kelly JP of Fitzwilliam Square. Vincent was commissioned in the RIR 1888. Promoted Lieutenant 1891 and married Anne Teresa Boland in 1897. She was the third daughter of Patrick Boland and sister of John Pius Boland MP. Captain 1898. On the 25th Oct 1899 the 2nd Bn set sail from Belfast on board the Britannic. They arrived in The Cape 9 November and went into action at Stormburg 10 December.There was no time for reconnaissance, and preparations were rushed. Early the next day, the British troops hastily boarded the trains, but then sat for hours under a hot sun while locomotives were found. They were already tired when they reached Molteno close to their objective and, then set off on a night march with fixed bayonets after a hasty meal and very little rest. The locally engaged guides were soon lost, and the force wandered about the veldt all night. The attack on the Boer position the next day was ill-directed, ill-handled and ill-supported with the RIR coming under fire from their own artillery. The force had to retreat and were harassed back to Molteno. Over 200 men of the Bn were forced to surrender. Vincent was among the wounded. On 3 April 1900 a column of the Bn including Vincent was in the area of Reddersberg when they were threatened by a large Boer Commando of over 4500 men, and took up hastily prepared positions that were untenable for the three rifle companies, The Boers demanded their surrender: this was refused and the RIR spent the night with little food and water. The next day The Boers overran part of the position and split the defence in two and the RIR with no ammunition left had little option but to put up a white flag. 388 officers and men were taken into captivity. A relief force that had been close by were recalled by the General commanding who was later sacked for his incompetence. The RIR officers were moved to prison camp at Waterval. It was described as a 'long, white shanty, with a fairly large compound, enclosed by formidable barbed-wire entanglements . . . There are electric lights all around the enclosure making escape a matter of difficulty. Inside, the place looks more like a cattle shed than anything else. A long, galvanised iron building, divided into sleeping rooms, and four small bath rooms, a servants' compartment and kitchen, and eating rooms . . . “There is no flooring. The drains consist of open ditches, while the sanitary arrangements are enough to disgust any human being.” The ordinary soldiers fared worse. In 1908 the Kellys bought Montrose House and Gardens in Donnybrook from the Earl of Pembroke. This property later became the grounds of RTE. He returned to active service as a Major with the Royal Munster Fusiliers in the Great War, joining the BEF in November 1915, and was subsequently wounded again. Later he served with the RAF. Major Henry Edward Green (OB93) and Colonel Arthur Herbert Wood (OB93) Scottish Rifles. The remarkable tale of two school friends, two brother officers and who became music hall entertainers together. The first of these is Henry “Barty” Green (93) the son of a Judge and then Arthur Wood (93) youngest son of a Field Marshal, they left Beaumont together, Joined the Cameronians (The Scottish Rifles). In the Boer war at the Battle of Spion Kop, Green saved Wood’s life rescuing him after he had been wounded and under fire for which he was awarded the DSO. Both lovers of the theatre and acting they retired to go on the music hall stage – extraordinary for men of their position in society at that time. Both were to re-join the colours for WW1. The Times, Wednesday July 4 1956. MAJOR H. E. GREEN Major Henry Edward Green, D.S.O., O.B.E., died recently in Funchal, Madeira, in his eighty-first year. He was born on March 19, 1876, the son of the Hon. John Philip Green, a Judge of the High Court, Bombay. He entered the Army, after attending Beaumont and Sandhurst, in 1896, served in Sierra Leone in 1898, and in the South African War. He was wounded at Spion Kop, twice mentioned in dispatches, was awarded the D.S.O., and the Queen's medal with four clasps. After service with the Cameronians, he transferred to the King's African Rifles in 1914. He fought in the East African and Nyasaland campaigns, in which he was again wounded and mentioned in dispatches. From 1924 to 1936 he was staff officer of the Nyasaland Volunteer Reserve and was appointed O.B.E. in 1930. He was an admirable painter and sculptor in wood, and designed the famous Nyasaland "Leopard" postage stamp. He had lived in Madeira since 1947. He married in 1913, Edith, daughter of Mr. Roger Cleveland, of Berkeley, California, who survives him. The sword ordered in 1896 is a plain oval rifles sword with the standard blade etchings of this pattern sword save for the owner’s initials of Green Hen y Edward in the cartouched panel. The sword was sharpened for active service which was undoubtedly useful as Lieutenant Green was wounded in saving his great friend Lieutenant Arthur Wood at the Battle Spion Kop for which action he received the DSO in 1900. 2/Lieutenant Green is the back row, extreme right. The Battle for Spion Kop. "The Scottish Rifles arrived at the summit of Spion Kop between 2.30 and 3 pm and were pushed into the firing line by companies, which had to move on to the plateau in single file along a narrow path down which the wounded were being carried. On reaching the plateau the two leading companies became hotly engaged at close range. Some men of the 2nd and 3rd companies then charged the opposing Boers in flank, in order to relieve the pressure on No 1, or A company. This was successful, the enemy retiring, but cost 1 officer and several men killed, and 3 officers and more men wounded. Gradually the battalion got extended, and by 4.40 pm had taken up a position across the summit. At one part, on the right, when the Scottish Rifles pushed forward, the original firing line had quite disappeared, and the Boers were where it should have been, and that within 60 yards of rocks which, if occupied by the Boers, would have enabled them to command our only approach to the plateau. 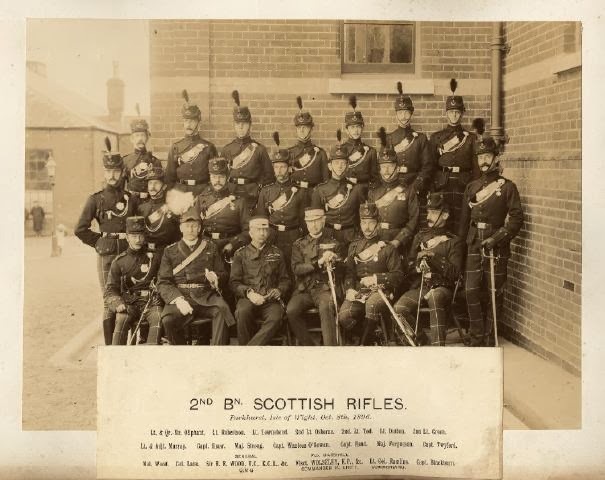 Like other troops on the hill, the Scottish Rifles fought splendidly and held their ground marvellously well. Their losses on the day were very heavy. Four officers and 33 men were killed or died of their wounds; 6 officers and about 60 men were wounded. In his telegraphic despatch of 27th January 1900 General Buller says, "Our men fought with great gallantry, and I would specially mention the conduct of the 2nd Scottish Rifles and 3rd King's Royal Rifles, who supported the attack on the mountain from the steepest side, and in each case fought their way to the top, and the 2nd Lancashire Fusiliers and 2nd Middlesex, who magnificently maintained the best traditions of the British army; and Thorneycroft's Mounted Infantry, who fought throughout the day equally well alongside of them". When addressing the troops after the retirement the general especially mentioned the two rifle regiments. Mr Bennet Burleigh wrote, "Nothing could have been grander than the scaling of Spion Kop by the Scottish Rifles and 60th of glorious reputation". Music-Hall Entertainers - Army Officer at Aldershot Hippodrome. The Aldershot correspondent of the "Standard" writes: It takes a soldier to entertain soldiers if one must go by the reception that the audience at the Aldershot Hippodrome last night gave to Captain Arthur Wood and Captain Henry Green, D.S.O., both of the Scottish Rifles, who, having retired from the Army, have gone on the music-halls as professional entertainers. Captain Arthur Wood, who is a son of the famous Field-Marshall Sir Evelyn Wood, V.C., is well known at Aldershot, and during his service there as A.D.C. to General Smith-Dorrien he frequently took part in an amateur performance for charity. It was his success as an amateur that encouraged him to take up music-hall work professionally. Captains Wood and Green must not be regarded as young soldiers suddenly enamoured of stage life. They are hardened veterans of the field. It is possibly the first time that the music-halls have been professionally invaded by officers of the British Army. It may well be that their past friendship and the action at Spion Kop gave rise to the song “Two little Boys”. Arthur Herbert Wood (93) brother of Evelyn and Charles and Son of Field Marshal Sir Evelyn Wood VC. While at Beaumont he was an honorary page to Queen Victoria. After commissioning he saw service in India in The Tochi Expedition which was a punitive raid by Anglo-Indian troops to put down a rebellion there. It started with an attack by the Madda Khel section of the Waziris in June 1897. The following year he was on the Nile Expedition sometimes called the Sudan War or Mahdist Revolt when he was ADC to Kitchener accompanying him at the Battle of Omdurman. Then it was South Africa and once more reunited with Green in the 2nd Battalion. This sword was originally purchased in 1896 by Sir Evelyn Wood VC to give to his son Arthur, who had just joined the 2nd Battalion of The Cameronians (Scottish Rifles). Sir Evelyn Wood had also served with the 2nd Battalion and had commanded it for a short time. He later went on to win the Victoria Cross medal and become a Field Marshall. Arthur Wood took the sword with him to South Africa during the Boer War from 1899 to 1902, but lost it, probably in battle. In the 1950s a farmer in South Africa dug up the sword in his field, after hitting it with his plough. He recognised the badge of The Cameronians (Scottish Rifles) and had it presented to the museum in 1958. The scabbard, or cover for the blade, has rusted from its time buried in the earth, but the blade is in surprisingly good condition. As mentioned above Arthur left the army for the stage (I’m not certain what Queen Victoria would have thought) with Green having held another ADC’s appointment with General Smith- Dorrien later known for his successful defensive battle at Le Cateau WW1. Back in the Army for WW1, Arthur served at both Regimental and Staff levels and was MID. He eventually retired as a Colonel in 1927: he did not return to the professional stage. Three other OBs served as regular officers with the Cameronians in the South African Campaigns.